I’m sure that about 95 other Roadster owners will love you. Mark, I think it would also help if you get find a way to direct the cold air to the occupants’ faces. 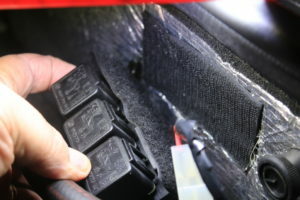 I don’t recall how your air outlets are configured (we didn’t try your a/c) but on the Anniversary Model Plus 8 I drove 11 years ago the outlets were buried down in the dash above the transmission cover. Mark, there is a better way. 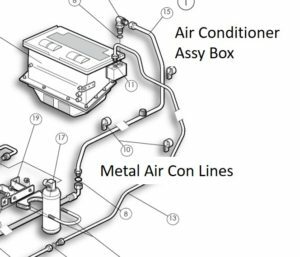 By tying the input and output of the AC box together you lose the ability to heat the car. Which may not be a problem for you folks in Florida, but will be an issue here in Ohio. 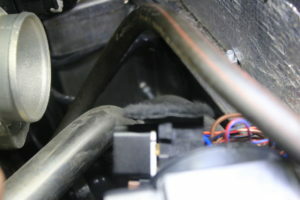 There is a way to just turn off the hot water going through the box by moving a hose or two and inserting a quarter turn valve in one of the hoses. 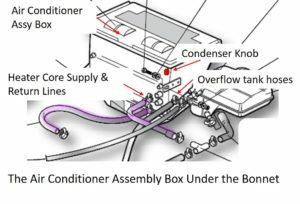 I don’t have the diagrams at hand now, but and entire kit of modifications to the ac system is on the horizon that will improve the performance three fold at least. I have a prototype on my car and it is going through testing as we speak. 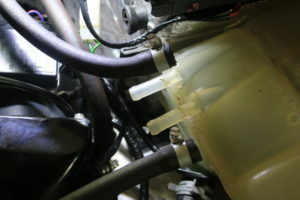 We hope to release details of this kit in time to improve your cooling system next summer. Talk to Rick Frazee, an automotive AC engineer and I have been working on this for a year now and we are about ready to print the details, once we have the manufacturing and sourcing details ironed out. If anyone would like to purchase one of these kits, please let me or Rick know.